As another new year is upon us, I have so much to look back on and be thankful for. This past year I was able to travel the country visiting woodworking shops and was even able to squeeze in a few classes. I unexpectedly acquired some HUGE woodworking tools (and when I say huge, I mean a 3,000 lb 36″ antique bandsaw, and a full turn of the century blacksmithing shop). Our farm saw lots of growth and many finished projects. It also brought lots of unexpected interruptions and heartbreak, but we have learned SO much and the hard moments make the happier moments that much better. The biggest thing I’ve learned this year is to live in the present and stay focused on future goals. As humans, the way we live today creates the world we will live in tomorrow. As woodworkers this is certainly true. In 2016 I chose two words I wanted my actions within the year to reflect: Gratitude and Grace. Emphasizing those areas helped me grow in some huge ways as a person. It gave me new eyes for our farm, woodwork, and the many opportunities I have been given. For 2017, I have chosen the word Focus. I want to work on being more focused in every area of my life. I’ve set short and longterm goals (some pretty big ones, about which I can’t WAIT to share), and I want to be working each day towards reaching those goals. I am extremely easily distracted. I love starting projects, and I really struggle finishing them. Between the farm, travel, my job managing the woodworking program at Pratt, the classes I’m taking, and my writing gigs, I cannot afford to continue to allow myself to juggle multiple projects at once in the shop too. So I’ve disallowed myself from starting any new projects, and have been making a concerted effort to cross off every project by the end of December 2016 so I can start January 2017 with an empty bench and a clear head. 1. Thoughtfully create reasonable, attainable short and longterm goals. Write them down somewhere you will see them every day. 2. Make a specific list of projects you’d like to tackle in 2017. Write them down somewhere you will see them every day. 3. Create a shopping list for tools you’d like to add to your kit in 2017, write it down, and don’t stray from it. This will not only help you keep your focus, but will also help your pocketbook. 5. Ask for help- whether it’s needing accountability in how you spend your time in the shop or whether you’re stuck on a project and literally just need help on a specific problem in the shop- there are tons of resources available: online forums, Facebook groups, local classes, other woodworkers in your area. 6. Get a kitchen timer for your shop. Time certain tasks and activities and look for areas to improve timeliness and efficiency. If you have a goal to spend ten minutes sharpening tools, set the timer, and do not allow yourself distractions until it rings. 7. Leave your phone in the other room. 8. Turn off the music/TV in the shop and give your full attention to the task at hand. 9. Before you walk through the door of your shop, have in mind one thing- one small thing you KNOW you can accomplish. Walk through the door and accomplish it. Accomplishing that first thing will give you the confidence to tackle the next thing, and the next after that. Best of luck and plenty of focus to you in 2017!! 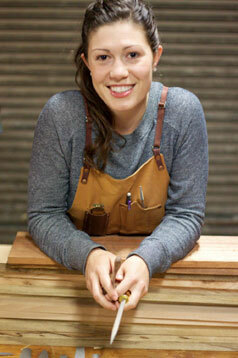 Anne Briggs Bohnett is a 27 year old woodworker out of Seattle, Washington. She and her husband Adam own and operate a small farm aimed at teaching youngsters about animal husbandry, traditional woodwork, and it’s also where their food comes from! Anne has been seriously pursuing woodwork with a focus on handtool use for three years and is passionate about the preservation of traditional methods and skills and building community.